One of my colleagues recently threw a lunch party on the occasion of his son's first birth day party. He lives in Goodmayes with his wife and son. After going through some options like Sarvana Bhavan and Sri Rathiga, he finally chose "London Darbar" as the venue for the party. All the 3 venues mentioned above are close to Ilford station. I think he made a good choice. 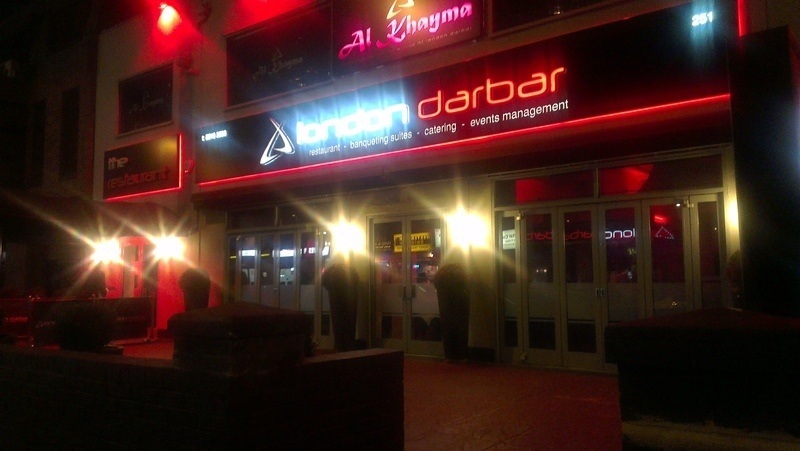 London Darbar has 4 venues located close to each other. It is about 5-7 minute walk from Ilford station. The venue he selected / got was the 4th one. It is on the left hand side of the road if you go left as soon as you come out of Ilford station. It is on the same side in which Sarvana Bhavan is located and is a few seconds away from Sarvana Bhavan. It is on the 1st floor and next to the beautiful Al Khayma, which I presume is a Moroccan restaurant. There were about 50 people attending the birthday function. The function timings were between 12 and 4 PM. The space was quite sufficient for 50 people. There were nicely decorated round tables and each table was surrounded by about 8 chairs. There were about 6 to 8 such tables. The place was nicely decorated with balloons and other items of decorations. Empty spaces on the floor were arranged with 2 to 3 big and wide rubber / plastic vessels called ball pitt, filled with balls and toys for kids. By the way the ball pits were arranged there by my colleague and not London Darbar. Within no time and some time the kids and the adults became comfortable respectively :). After some time the starters were ready. Perhaps, since most of the guests were vegetarian, the food was vegetarian. The starters consisted of chilli paneer, verg manchurion, aaloo tikki chat. The main course contained paneer butter masala, methu muttar malai, dal makhani, nans, rice and gulab jamun. Both the starters and the lunch was nice. It was Indian cuisine. The cake cutting ceremony was held between starters and lunch. The cake was based on the theme of the video game "Mario" with a sparkling candle on it and it was quite nice. One thing to note is that the officials might have told him that if he wanted to stay after 4 PM, he has to pay £150 extra. My colleague was charged £21 per person and I guess 12% vat on the entire amount (I'll confirm soon).